For more than 35 years, Ann Fessler’s work has focused on the stories of women and the impact that myths, stereotypes, and mass media images have on their lives and intimate relationships. Fessler turned to the subject of adoption in 1989 after being approached by a woman who thought Ann might be the daughter she had surrendered for adoption forty years earlier. Though the woman was not her mother, Fessler—an adoptee—was profoundly moved by the experience. The conversation that ensued changed the focus of her work. Since that time she has produced three films, numerous audio and video installations, and a non-fiction book on adoption. Between 2002-05, Fessler conducted over 100 interviews with women who lost children to adoption during the 28 years that followed WWII, when a perfect storm of circumstances led to an unprecedented number of surrenders. Her short films on adoption have won top honors at festivals and have been screened internationally. Her book, The Girls Who Went Away (Penguin Press, 2006) was chosen as one of the top 5 non-fiction books of 2006 by the National Book Critics Circle, and was awarded the Ballard Book Prize, given annually to a female author who advances the dialogue about women’s rights. In 2011, her book was chosen by readers of Ms. magazine as one of the top 100 feminist books of all time. In 2014, Fessler received the 2014 Adoptee Trailblazer Award. The award was announced at the Eighth Biennial Adoption Conference at St. John’s University on May 31, 2014. The Adoptee Trailblazer award is to honor an adult adoptee whose work inspires and is foundational for professionals in adoption and foster care work. The award is unique in that it recognizes adult adoptees specifically for their pioneering work in a field in which they were “insiders” as adoptees, but through their hard work, innovation, professionalism, intellect, and dedication became leaders and often reformers of the practice of adoption. Told through a collage of archival footage and video shot by Fessler of the farms and rivers of the rural Midwest, Along the Pale Blue River is an autobiographical tale about a young pregnant girl who flees her rural community for a town where she can be invisible, and the daughter who returns forty years later, (filmmaker Ann Fessler) propelled by a series of coincidences and a dream, to look for a yearbook picture of the woman who gave birth to her. There, Fessler discovers the source of the river from her childhood town and realizes it has always flowed from her mother to her. Along the Pale Blue River received the Spirit of Moondance Award at the Moondance International film Festival, Boulder (2002); the Gold Prize for Experimental Film at the Big Muddy Film Festival (2002); the Judges’s Choice for Independent Film at the New England Film & Video Festival, Boston (2002); First Place – Experimental at the Athens International Film and Video Festival (2002); and was screened at numerous festivals including the Arizona International Film Festival (2002); Taos Talking Pictures Festival, Taos, New Mexico (2002); Edinburgh International Film Festival (2002); Women in the Director’s Chair International Film Festival, Chicago (2003); Marblehead Film Festival, Massachusetts, 2005. Along the Pale Blue River has also been exhibited in galleries and museums, and as part of a large solo installation Close to Home (2001) that opened at the Bell Gallery, List Center, Brown University and was subsequently included as part of Fessler’s Everlasting Installation at the Maryland Institute College of Art in 2003, where Fessler’s earlier Close to Home installation was combined with her Everlasting, Baltimore — her first site-specific, surround sound audio installation—composed from interviews with first mothers (at this site from the Mid-Atlantic region). Along the Pale Blue River was revised in 2013 and is currently part of Home Truths: Photography, Motherhood and Identity curated by Susan Bright. Home Truths opened at The Foundling Museum in London (2013) and has traveled to the Museum of Contemporary Photography, Chicago (2014) and Belfast Exposed Gallery in Northern Ireland (October, 2014). Cliff & Hazel is an adopted daughter’s humorous and poignant portrait of her adoptive parents. Ann documents a trip home to celebrate her mother’s 80th birthday. It is her first visit since the death of her father and words come easier in his absence. Hazel is outspoken about her anti-women’s liberation views and her belief that a woman’s place is in the home. She also believes that men are smarter than women and she tells her feminist daughter that the proof can be found in the television program Jeopardy, where there are always more men than women. As the video progresses the contradictions and complexities of Hazel’s life begin to unfold. Hazel’s tearful response to a made-for-TV movie about a daughter’s search for her birth mother prompts a conversation afterwards in which Hazel reveals that she was also adopted. Through the story of Cliff and Hazel, Ann tells her own story—the story of an adopted daughter who on the surface seems different in every way from her parents, but through the making of this documentary comes to better understand her parents as individuals, their interdependence as a couple, and herself as their daughter. Cliff & Hazel is about generational difference, unspoken words between mothers and daughters, and the complex nature of family relationships and identity, especially in families brought together by adoption. 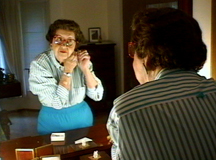 Cliff & Hazel Premiered at the 2000 Women In The Director’s Chair International Film Festival, Chicago. It received a Documentary Award from the Athens International Film/Video Festival, Ohio University, 2000, and the Big Muddy Film Festival, Southern Illinois University, 2001, and an Honorable Mention Award from the New England Film/Video Festival, Boston, 2000. In 2003, it received the Best Short Documentary Award from the Magnolia Independent Film Festival in Starkville, Mississippi. It was also screened at Providence Women’s Film Festival, Rhode Island, 2001, and the Tupelo Film Festival, Mississippi, 2004. Cliff & Hazel has also been screened more recently as a double feature with A Girl Like Her at the Wexner Center for the Arts, Columbus (2012), and the Sie Film Center in Denver (2013).